last week i went out for a lovely lunch with my friend m.
we had a nice, intelligent chat over falafels and lemonade that touched on a little bit of everything: religion, psychology, love, craft...and eventually, we landed on the subject of decluttering. m. admitted she's been feeling overwhelmed by her *stuff* of late, and was having a hard time sorting though all the stuff she had collected over the years. it had reached a critical point for her...she HAD to get rid of stuff, but was completely flummoxed and unsure of where to begin. "what if i could use this later for something?" "this was expensive...i feel bad having spent money on it or that others spent money on it, and thus i'm remiss to let it go." m. confessed that almost everything she owned seemed to hold some importance, or it evoked a memory; some negative memories, some positive memories. she felt incredibly attached to EVERYTHING, in a way that she could hardly explain. m. didn't use or really even LOVE many of these items, and they were getting in the way of the things she DID love. and while some items were inherently lovely, she felt they didn't represent who she truly is...they just were not her style. m.'s STUFF was threatening to take over her life. it was time to sort through it all, but how? where could she begin? how could she even approach such a seemingly daunting task? i know a lot of people (including myself) are in the same clutter-filled and nearly sinking boat. we are deeply entrenched in the consumerist culture in which we live. we go out and collect things we need and want, and sometimes, those collections get out of control. but how much of this stuff do we truly use, need, or love? how much of it is just stuff that we may never get use of, regardless of any good intentions we might have for said objects? i'd venture to guess that much of it, while perfectly useable, is just STUFF that you or i don't really need, and would be better off without. things are nice, but realistically and honestly, LESS IS MORE. when you have what you actually NEED and LOVE, pawing through your closet can be easy, and relatively stress-free. you can see what you have readily, and can be more assured that what you have suits your lifestyle, personality, and body. no more needing to comb through the so-so stuff to get to the stuff you actually adore and use. doesn't the idea of that sound NICE? but again, how would one go about it? well, as i've been through this myself numerous times, i've got some tips to share, and i'll do so over the course of three installments! it's super important to get your mind space and physical space souped up before you scrutinize your stuff! 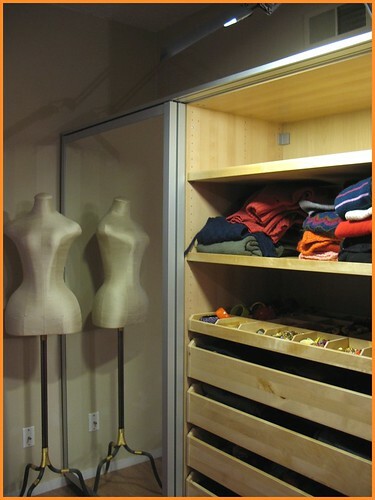 -first and foremost, make a concerted effort to keep a positive attitude about the decluttering your wardrobe. think of the process of delcluttering as an amazingly good thing: it's a fresh start! you're going to a.) eliminate stress in yourself and those who live with you! b.) end up with what you NEED and LOVE. and c.) put the kibosh on clutter. -make sure you have a full length mirror at the ready. you want to be able to see yourself from head to toe. none of this half-body bathroom mirror business. -open up all the curtains and windows in the room, or turn on all the available lights in the room where you'll be doing all your sorting. you want to be able to see yourself and the clothes and accessories which you will be evaluating in the best possible light. good lighting allows you to see the true colors and textures of your clothing and accessories and how they honestly work with your skin tone and figure. -before you begin, eat a good healthy meal and set aside a glass of water that you can sip on while you work. dehydration and low blood sugar are bad bedfellows for your brain and the task at hand...you want to be at your best when you're trying to determine if you TRULY love and look good in that denim skort, lace-up bustier or argyle socks! -to set the mood, put on some great music! choose some tunes that you know will motivate but not distract you. i think something that gets your blood pumping is just perfect for this sort of task! i love to put on a breaks or hip-hop dj set while i am working through my closet and trying things on. when i need a break from the intensity of sorting and deciding i can dance around the house a little! -shower, put on makeup, and do your hair! this tactic helps me, big time! i can evaluate the clothes i am sorting through as if i was getting dressed to go out in the usual way, without being distracted by the possibly scary state of my makeupless face or wild bedhead! -if you're a little unclear about your personal style and are feeling overwhelmed trying to figure out who you are and what you love, make a mood board/inspiration board first. if ye know thyself, the process of decluttering your stuff will be much simpler and less stress-making. -gather up those trashbags or get out those empty shopping bags you been saving! these will be the eventual receptacles for your discards.